2018 Florida Chapter of the American Society of Landscape Architects design award winning project. Two courtyards stand at the center of this 6-acre pedestrian and dog friendly community. 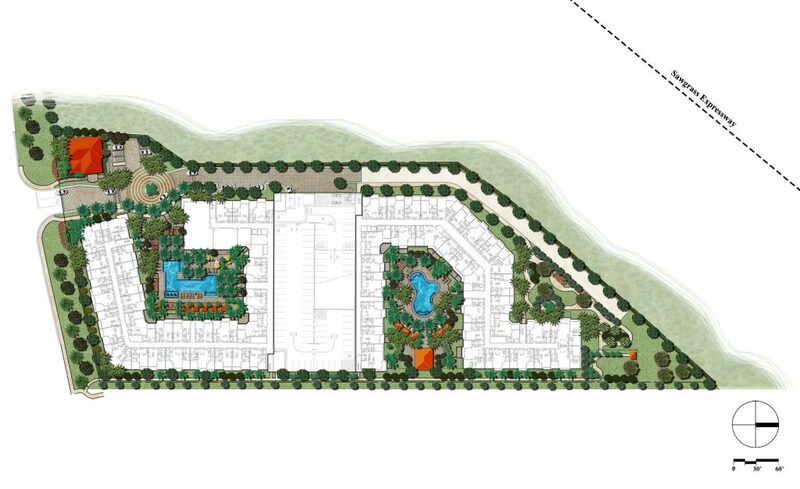 The 350-apartment site is located in the City of Sunrise with two residential buildings and a parking garage tucked in between. Open space is at premium in this project. Restoring the wetlands and limiting the construction to the uplands meant high density and large building footprint. Landscape Design Workshop organized the community around the negative space created by the building footprint. Each one of these areas is programed with interconnected spaces offering a diverse outdoor experience. The collaboration between the client and the landscape architect led to the efficient use of open space opportunities within the site constraints. This collaboration also created a vibrant community with a variety of outdoor spaces serving a broad spectrum of residents. Provided landscape architecture and planning services for the entire project including site planning, planting, hardscape, lighting & irrigation. The first courtyard amenity area includes a contemporary swimming pool with a wall fountain, cabanas, outdoor café, outdoor living rooms & flowering-vine trellises. The second courtyard amenity area provide a lagoon swimming pool, pool house with summer kitchen and 2 cabana courtyards. Completing the outdoor experience is a dog park, serene garden spaces and lush tropical planting.